has published numerous articles on the new spiritual paradigm emerging in cultures worldwide and is the author of Shambhala: The Fascinating Truth Behind the Myth of Shangri-la, published in ten foreign languages. Her latest book is Mysteries of the Bridechamber: The Initiation of Jesus and the Temple of Solomon. She lives in New South Wales, Australia, and can be contacted through her website at www.victoria-lepage.org. Sufism belongs in spirit to the modern age. It has an affinity with it; it is in tune with secularism, with the modern thirst for objective knowledge. Yet the Sufi tradition is immensely old. In some quarters a belief still persists that it is a mystical offshoot of Islam, but most reliable sources claim it is far older than the Muslim religion. Gurdjieff also told Bennett that the paintings in the Lascaux caves in the Dordogne, France, which the great authority on parietal art, the Abbé Breuil, has dated to about thirty thousand years BCE, were the work of later Sufi descendants of the shamans.6 Gurdjieff took the story of Atlantis literally. He associated it with pre-sand Egypt and believed the Lascaux artists were members of a brotherhood that survived after Atlantis sank seven or eight thousand years ago.7 They were highly evolved Masters of Wisdom, “‘psychoteleios’ who had learned the secret of immortality,” and whose centres of initiation on the now submerged Atlantic continental shelf have left us, in their paintings of deer, bison and auroch, a magical message of prehistoric spirituality that lay undeciphered for many thousands of years. In that palaeolithic age art and religion were still one; secular and religious consciousness had not yet separated out, and spirit and matter were not yet in opposition; nor was evil an absolute force seeking the overthrow of good. All things and all attitudes to things were filled with the magnetic, synthesising radiance of hypercosmic energy, which Gurdjieff called conscious energy. In such a unified world the great Initiates developed the unique type of spirituality that still distinguishes Sufism today, wherein the polarising activity of mind is submissive to the over-riding Spirit that ever seeks a return to the One. Only in the later more alienated religious systems, Gurdjieff believed, do we find the divisive seeds of philosophical dualism. At the apogee of the Sumerian civilisation, Bennett continues, the Sufis are believed to have founded a brotherhood called the Sarman or Sarmoun Society, which, according to Gurdjieff, met in Babylon as far back as c. 2500 BCE and was responsible for preserving the inner teachings and initiations of the Aryan tradition in a period of religious decline. Sarmoun is a word meaning bee in Old Persian, and refers symbolically to the practice of the brotherhood of storing the “honey” of both the traditional wisdom and the supernatural energy or baraka enabling it to be understood, and sending this double “nectar” out into the world in times of great need.8 The word Sarmoun can also mean “those who are enlightened.” The Sarmouni are believed to have secret training centres hidden to this day in the most remote regions of Central Asia. In Gurdjieff: Making a New World, Bennett conjectures that around 500 BCE the Sarmoun Society migrated from ancient Chaldaea to Mosul in Mesopotamia, moving north into the upper valley of the Tigris, into the mountains of Kurdistan and the Caucasus. There it became active in the rise of Zoroastrianism under the Persian monarch Cambyses I. According to Gurdjieff, the Society later moved eastward to Central Asia, twenty days’ journey from Kabul and twelve days’ journey from Bokhara. “He [Gurdjieff] refers,” says Bennett, “to the valleys of the Pyandje and the Syr Darya, which suggest an area in the mountains south-east of Tashkent.”9 Although Gurdjieff was never explicit about his relationship to the Sarmouni or the precise locality of the monasteries in which he trained towards the end of his travels, he provides many hints in such autobiographical writings as Meetings With Remarkable Men that this Sarmoun brotherhood, whose monasteries were situated on the northern slopes of the Himalayas, was the custodian of the most ancient wisdom known and the primary source of his extraordinary esoteric knowledge and powers. Gurdjieff came to the West as a man with a mission. He had journeyed extensively in the Caucasus, where it is thought he first entered the tekkes of the Yesevi dervishes of Sheikh Adi in the Kurdish foothills and later those of the Sarmouni in Afghanistan, receiving a number of initiations by the remarkable age of twenty two. Those closest to him maintain that he remained in touch with hidden Sufi sources throughout his life and received help and support from them. He clearly believed that he acted on their authority in setting up schools in the West that transmitted the cosmological and psychological teachings he himself had learned during his travels. Yet while freely recounting his many Central Asian adventures in his search for wisdom, Gurdjieff managed to draw a permanent veil of secrecy and ambiguity over all details of these intimate encounters with the dervish tradition. This of course is in line with the extreme reticence of the Sufi orders themselves. The Yezidis, a secretive Kurdish religious sect from which the Sufi Bektashi order has sprung, live to this day in the foothills north of Mosul in Iraqi Kurdistan pursuing a cult of angels. According to the British baroness E.S. Drower, who in 1940 published a detailed paper on the sect, the chief Yezidi angel is Malek Taus, the Peacock Angel who has some likeness to Lucifer, the fallen angel of Christian fame. A black serpent is also held in special reverence in the Yezidi religion as a symbol of magical potency – no doubt ultimately a symbol of kundalini and the spinal system of energies elaborated in spiritual physiology. While paying lip service to the Muslim faith, the Yezidi have their own unique cosmogony, mythology and ritual practices, which have more commonality with the Magian or Gnostic belief-systems than with either Islam or Christianity. Ceaselessly persecuted and destroyed by Kurdish Muslims and Ottoman Turks as well as Islamic armies of both Iraq and Iran, the once powerful Yezidi tribes have been almost wiped out as heretics of the first order. Only isolated groups are now left. These include small pockets in Central Kurdistan, the Russian Caucasus and in satellite communities in Syria, Lebanon, Anatolia and Iran. This is certainly in line with Gurdjieff’s belief that the roots of Sufism lie in a spiritual tradition of extreme antiquity such as is found in the Yezidi faith, and that it was probably centered in the Caucasus and Central Asia. Nevertheless, there is much evidence that Sufism continually developed beyond its initial form and amplified its teachings over the ages. The conquest of Spain by the Muslim Moors meant Jews, Muslims and Christians were able to live there harmoniously until the fifteenth century, creating a culture of superb beauty and intelligence which lasted until the Jews and Muslims were banished to Byzantium, and which gave Sufism entrance into the rest of backward Europe. During the same centuries Crusaders such as the Templar’s encountered the rich Saracen culture in the Holy Land and secretly brought back the cream of Sufi thought to Europe to enrich Christian theological scholarship, art and sciences. With the Mongol invasions, however, came difficult days for European civilisation as many sources of Sufi wisdom withdrew. The Sufi Masters of Wisdom known in Central Asia as the Khwajagan lineage withdrew at this time to the Trans-Himalayas, where their schools still persist. The Khwajagan were neither savants nor mystical ecstatic. They were practical men who assiduously practiced the breathing and mantric exercise of the zikr, fought their own weaknesses by means of trials based on humiliation and abasement, and during the Mongol depredations of the conquered western cities built new schools, hospitals and mosques. Some say these Masters, who may be synonymous with the Sarmouni, have continued to this day to head the Sufi hierarchy – which Bennett has called the Hidden Directorate – from its hidden Trans-Himalayan headquarters. Meanwhile, the Sufi orders left behind continued to strengthen their ties with other esoteric systems, such as the Magian secret societies in Persia and the Copts in Egypt, and to extend their formidable influence across the world into South-East Asia. In the Sunda Islands they amalgamated successfully with the indigenous shamans, Hindu-Buddhists and Taoists and were instrumental in establishing in Java one of the most influential schools of Tibetan Kalachakra Tantra in the world. The result was a chain of hybrid secret societies around the globe whose roots were buried deep in a freedom-loving soil compounded of Sufism, Magian wisdom and the Solomonic and Hermetic wisdom of the Egyptian Essenes. It was these pan-religious amalgamations that produced over the centuries initiatic schools like the Templars, the Chartres masters, the Rosicrucians, the Illuminati, the Freemasons and the Theosophists, all dedicated to working for the religious and scientific dawning of a new age free from religious intolerance. Throughout the long Sufi saga, the West had been unaware of intervention in its affairs, or indeed of the very existence of a powerful organization in its midst that was monitoring the course of history and at the same time maintaining its own hierarchy, objectives and worldview independently of the visible political and religious structures of society. But the Sufi masters knew that this unconscious condition, mainly imposed on the people by repressive forces outside their control, must end, and that the time of awakening was drawing near. As we now know, the series of Rosicrucian publications with their visionary and reforming talk of an invisible college, a “winged academy” dedicated to a commonwealth of man, created a furor in Europe. Some saw the publications as a hoax, others as a God-given sign of the millennium. As ever, the Sufis were not directly mentioned: but, sweeping like a rejuvenating wind through Protestant and Catholic lands alike, the movement stirred up by the mysterious manifestos became a potent though short-lived catalyst for change. It instigated a religious and intellectual uprising that sought reform in education, religion and science, promising a coming utopia in which the dignity and worth of every man and woman would be recognized. Frances A. Yates, a foremost Renaissance scholar, believes this period in the seventeenth century can rightly be called the Rosicrucian Enlightenment and that out of its “great reservoir of spiritual and intellectual power, of moral and reforming vision”14 came the Royal Society and the age of scientific revolution. Full of Christian mysticism yet also permeated with Hermetic-Kabbalistic angelology and alchemical religious philosophy, the Rosicrucian teachings proclaimed that this age of enlightenment, in which religion and science would no longer be antithetical, was at hand. Great advances were to be made and a reformation of the whole wide world would presage “a great influx of truth and light” into fallen society such as shone on Adam in paradise. For a time large factions of the Church espoused these ideas, and the Jesuits, themselves of occult and hermetic origin, took over much of the Rosicrucian symbolism and emblematic. Yet in the event the whole program was aborted by the fiercely reactionary response of the Spanish Inquisition and its political ally, the Hapsburg dynasty, which instigated the Thirty Years’ War, forcing thousands of religious dissidents to flee with the seeds of the new vision to the New World. The Sufi program had to incubate in secret for several more centuries. Not until the twentieth century, in a more tolerant and receptive age, were the Sufis finally able to reveal themselves openly. In 1921 Gurdjieff, the emigré and entrepreneur from Armenia, was the first to make this possible. He came with a crucial message for the twentieth century and, as we shall see, for our own era in the third millennium. 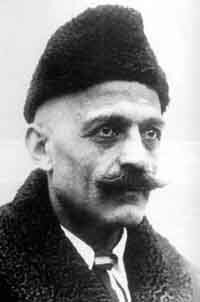 Of great personal magnetism, drive and unusual psychic powers, Gurdjieff burst upon the Western scene with his program for spiritual development, bringing to the European cognoscenti for the first time an awareness of the sacred ritual dances and dervish exercises of the East. These, he said, had strong links with Altaic shamanism and Tibetan and Chinese Tantra. But Sufis have never regarded spiritual exercises alone as adequate. Generally speaking, little is said in Sufi literature about baraka, the effective grace that makes spiritual development on this path possible, yet its importance is primary. Baraka, as transmitted from teacher to pupil, is said to be a high emotional energy associated with the heart centre, and according to Bennett, enables the pupil to do what would be quite beyond his unaided strength.15 It is this inner infusion of conscious energy – energy of a high spiritual nature – that enables the zikhr, the Sufi invocatory exercise, to be fruitful. Discipline, austerity and voluntary suffering, which Gurdjieff translated as conscious labour and intentional suffering, were also needed. By intentional suffering he meant exposing oneself to painful situations in order to help others. While the southern Sufi orders embraced the mystical doctrine of love and union with God, these northern Sufis were strongly influenced by Buddhism and, like the Khwajagan, were concerned with a total liberation from self and the world of appearances. They were regarded by the more conservative southern Sufis as unorthodox, even being accused of magical practices learned from the Siberian shamans to the north. Nevertheless, Gurdjieff saw great benefit for the West in the dervish practices, disapproved though they were by the more purist brotherhoods such as the Nach’shbandi and the Qadiri, and made his unique program available to all those wishing to develop their human potential. At his Institute for the Harmonious Development of Man in Fontainbleu, Gurdjieff trained his students in group dance movements set to dervish rhythms that demanded of them intense physical effort and coordination and which raised the body to a “high state of consciousness” conducive to a transformation of energies. He also encouraged his pupils to observe intensively their own psychic centers of thinking, feeling and instinct as a means of achieving a degree of self-government that man at present entirely lacks – but without which, Gurdjieff insisted, it is impossible for him to govern and maintain the planet. Public performances of Gurdjieff’s dervish dances were put on at various theatres, even in the prestigious Carnegie Hall in New York, and Europe and America marveled: nothing like it had ever been known. Sacred dances, Gurdjieff said, have always been one of the vital subjects taught in esoteric schools of the East… Such gymnastics have a double aim: they contain and express a certain form of knowledge and at the same time serve as a means to acquire a harmonious state of being. At one time it was his intention to use the movements in the traditional way for which they were principally intended in the ancient temples of initiation – that is, as a means of transmitting knowledge directly to the higher centers without passing through the mind, which is the way of Tantra. But a car accident in which Gurdjieff’s physical health was severely damaged put an end to his wider plans for the movements and turned his attention to writing and training selected people to carry on his work at a more intellectual level. Sufi prescience, Sufi aptitude for the right teaching in the right time and place, is well attested. In many respects, Gurdjieff’s writings contributed enormously to the familiarization of the West to the radical idea of the psyche or soul – the dynamic centre that mediates between the spiritual and the sensory functions – which at that time Sigmund Freud was also bringing to Western notice. Recognition of this unifying centre of relativity, which modifies the traditional absolutes of philosophy and religion on one hand and the physical sciences on the other, was just then opening up, and Gurdjieff’s psychological brand of theosophy, which became the vogue at the same time as Freudian and socialist theory, made a very great impact. The Gurdjieff schools of self-development spread to numerous countries and his ideas became common coinage in the new enlightenment of the sixties. Through the interest aroused in his methods and teachings, in which the centrality of individuation was paramount, Gurdjieff was able to give out for the first time a certain amount of information about the Sufi tarekats hidden in Eurasia. And in his train came a school of eminent Sufi writers like Guénon, Bennett, Ouspensky, Schuon, Hazrat Inayat Khan and Idris Shah, all of whom further opened up the world of Sufism to a vast reading public. One of the central strands in Gurdjieff’s belief-system was the principle of world-creation and world-maintenance, which he said was derived from “an old Sumerian manuscript” discovered by a great Kurdish philosopher. The doctrine can be summed up very simply: “Everything that exists maintains and is maintained by other existences.” Peculiar to Sufism and appearing in no other religion, it states that the whole of the universe is a web of mutually supporting systems, “apparatuses for transforming energy,” each one of which produces the means of sustenance for others. This law of reciprocal maintenance governs all of life and applies to man as well as in his relation to Mother Nature. The world is not made for man, as we have been taught; both are made for each other. Man’s destiny and the destiny of the earth are interdependent. The evolution of the one depends on the evolution of the other, the survival of one on the survival of the other. Man is not separate from the cosmic process; he is himself part of the ecosystem he observes out there, and he must serve the evolution of the world as well as his own. That is the law of the cosmos, even as the palaeolithic shaman defined it many millennia ago. From the Sarmounis, Gurdjieff learned that man is at present an automaton, a mere mechanism driven by the blind forces of action and reaction, his sense of identity fragmented, his will almost non-existent. Yet even work on himself will not redeem him without an acceptance that he is here to serve the world. Through Gurdjieff, therefore, the Sufis gave out to the twentieth century a new teaching, a new outlook on life that was revolutionary seventy years ago: man cannot advance spiritually unless he fulfils his obligation to planet earth, and through planet earth to the solar system. He must “pay the debt of his existence” by nurturing that which nurtured him. For man’s cross is a twofold spiritual destiny; to evolve as an individual, but also to serve the evolution of kingdoms other than his own, lives other than his own. Out of the friction these opposed drives generate, said Gurdjieff, there comes a transcendental third, the birth of conscience. This suffering of the tension between the opposites is the law of true religion and is alleviated only by the awakening of the mediating force inherent in the soul; that is, conscience or love. The Sufi theory of world-creation and world-maintenance – “a new master idea for the coming age,” as Bennett called it – has become increasingly relevant as the planet’s ecological crisis has worsened over the decades; and now, looking back from our vantage point in the new millennium, we see how it has indeed become the hallmark of our time, perhaps the key to its essential meaning. Wherever the next civilization is centered it must be where the third and reconciling power can operate; where conscience can find a home. That is the prime Sufi message for our generation, as it was Gurdjieff’s. 1. Ernest Scott, The People of the Secret, Octagon Press, London, 1985, p.45. 4. J.G. Bennett, Gurdjieff: Making a New World, Turnstone Books, London, 1973, p.94. 5. J.G. Bennett, The Masters of Wisdom, Turnstone Books, London, 1977, p.40. 6. J.G. Bennett, Gurdjieff: Making a New World, p.86. 10. Adrian G. Gilbert, The Magi, Bloomsbury, London, 1996, p.49. 11. Hugh Schonfield, The Essene Odyssey, Element Book, UK, 1984, p.166. 12. J.G. Bennett, The Masters of Wisdom, Ch. 6. 13. Scott, op. cit., p.176. 14. Frances A. Yates, The Rosicrucian Enlightenment, Routledge & Kegan Paul, London, 1986. 15. J.G. Bennett, Gurdjieff: Making a New World, p.278.